Geshe Yeshe Thabkhe was born in 1930 in Lho-Kha, Central Tibet and became a monk at the age of 13. 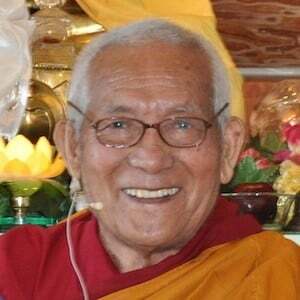 After completing his studies at Drepung Loseling Monastery in 1969, he was awarded Geshe Lharampa, the highest degree in the Geluk School of Tibetan Buddhism. Currently he teaches at the Central Institute of Higher Tibetan Studies as a professor of the Indian Tradition of Buddhist Philosophy. He is an eminent scholar of both Madhyamaka and Indian Buddhist studies. His works include translation of The Essence of Good Explanation of Definitive and Interpretable Meanings (Tib. Lek-Shey Nying-Po) by Tsongkhapa into Hindi, and A Commentary on the Rice Seedlings Sutra (Skt. Salistamba Sutra )by Vasubandhu. He has facilitated many research works such as a complete translation of Lama Tsongkhapa’s The Great Treatise on the Stages of the Path to Enlightenment (Tib. Lam Rim Chen Mo ) a major project undertaken by The Tibetan Buddhist Learning Center in New Jersey where he teaches regularly. Read Geshe Yeshe Thabkhe’s thoughts on Sravasti Abbey.